Citizens Organized for Sound Transportation (COST) brought to attention Ronnie Duncan's dual and conflicting roles as a co-founder, leader and fundraiser for Yes for Pinellas while serving as Chairman of TBARTA. You can read the COST press release, and further analysis on potential violations of the State of Florida Code of Ethics. That’s why it’s disappointing to see the head of the area’s regional transportation agency, known as TBARTA, take a leadership role in the group that is raising private money to get the Greenlight measure passed in November. TBARTA Chair Ronnie Duncan can be a cheerleader for Greenlight, but he shouldn’t get involved in raising money. The Tribune goes on to state that Duncan should step away from Yes for Greenlight. We believe he is tainted and cannot effectively separate from Yes for Greenlight and should resign from TBARTA. The Tribune is not the only ones that agree with us. We also know there are other local leaders across the political spectrum that agree with us. 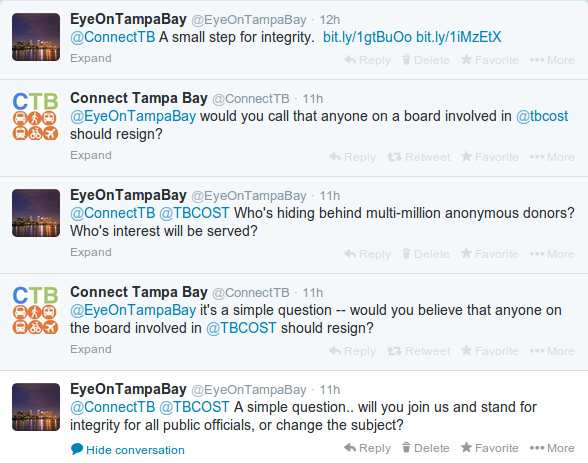 We tweeted this "small step for integrity" yesterday morning, including to Connect Tampa Bay. Surely they'd be concerned about the integrity of Greenlight Pinellas plans they hold so near and dear. After all, there are things we agree with Connect Tampa Bay. For example, we collaborated with them last year on Public Transportation Commission reform. This twitter conversation occurred Wednesday February 12 at approximately 9am. Kevin Thurman, Executive Director of Connect Tampa Bay, is trying to draw some equivalency that does not exist. Duncan told the Tribune’s Christopher O’Donnell that he consulted TBARTA’s attorney and was told he can be on the steering committee for the privately funded Greenlight campaign, known as Yes Greenlight, as long as he makes it clear he is doing so as a private citizen and not in his capacity as TBARTA chair. This confirms that Duncan has a conflict of interest by participating in Yes for Greenlight since he has to be so careful about what he says in any speaking engagement. How is the average public citizen supposed to know? Will Duncan change hats on paragraph boundaries or is a mid sentence change of hats OK? Oh, and yes, he's expected to raise $1 - $2 million... all conveniently anonymous behind the 501c4. That matters, if the State of Florida Code of Ethics are to mean anything. Within an hour, COST received a call from Anna Philips, Tampa Bay Times reporter. She raised questions about Karen Jaroch, who serves on the HART Board, and works for Heritage Action, also a 501c4. But the gig was up. We confronted Ms. Phillips, and she admitted she'd been fed this line of questioning from Kevin Thurman, Executive Director of Connect Tampa Bay. Ms. Phillips was confused on many facts. She tried to draw parallels with the 2010 Hillsborough referendum, and suggested that No Tax For Tracks was a 501c4. It was a PAC, registered with Hillsborough County Supervisor of Elections, with a public donor list. She questioned Heritage Action involvement in 2010. Heritage Action was just founded in 2010 to address Congressional legislation, and certainly was not involved in a local Hillsborough County 2010 referendum. Kevin Thurman, Executive Director of Connect Tampa Bay likely would not know either. He's only lived in Tampa a little over a year. Despite the corrections to a non-story, Ms. Phillips got the hit job published for Kevin Thurman, Executive Director of Connect Tampa Bay. But Ms. Phillips still could not get it right. On her blog, Calvert wrote: "There is a problem when the chairman of a state agency serves as chairman for a private organization whose anonymous big dollar donors are hiding behind a 501c4, whose true interests are as hidden as the donors." On Wednesday, referendum supporters shot back, arguing that one of Calvert's allies, Karen Jaroch, is guilty of the same thing. We sourced the above information in our blog from Ms. Phillips February 7 article. The letter COST sent to Ronnie Duncan did not mention any 501c4. Ms. Jaroch is not leading any fundraising for an organization whose mission conflicts with her role as a member of the HART board. She's not a fundraiser and Heritage Action has no interests with HART. She has not been accused of any wrongdoing. Mr. Duncan figuratively will be collecting millions from a group of anonymous donors with the left hand, while controlling the Tampa Bay area master transportation plans with the right hand. Do you see any equivalency? For us here in the real world, there is meaningful and substantial difference. Ms. Phillips and Kevin Thurman, Executive Director of Connect Tampa Bay apparently are unable to understand the context or the intent of ethics and integrity. COST publicly made their statement demanding Ronnie Duncan's resignation, and released it to the media. Kevin Thurman, Executive Director of Connect Tampa Bay did not publicly make his case. He sought a receptive reporter to pursue and publish his petty accusations. Kevin Thurman, Executive Director of Connect Tampa Bay had a choice to join us in a "small step for integrity". He chose to take a cheap shot and to look the other way instead.